You may have heard of Alex’s Lemonade Stand Foundation. A little girl named Alex was diagnosed with cancer when she was 1 year old. 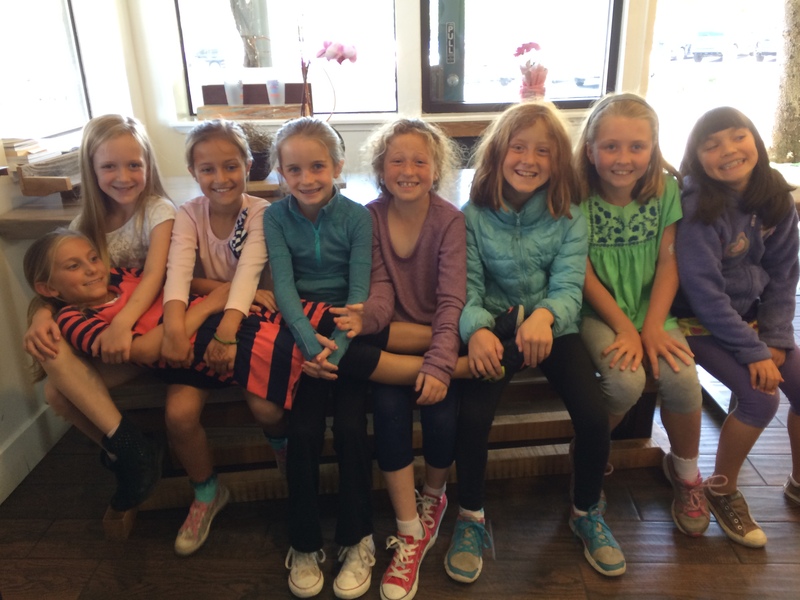 When she was four years old, Alex asked her mom if she could have a lemonade stand to raise money for “her hospital”. Her legacy lives on as lemonade stands all over the country continue to support her pediatric cancer foundation to the tune of $100 million as of January 1, 2015. How cool is that?! 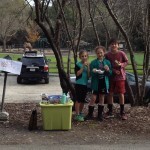 My kids and friends wanted to make cookies and sell them at a stand at the park. 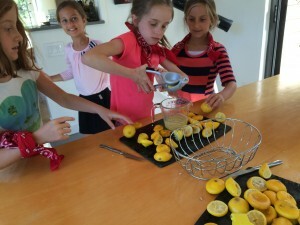 They’ve done lemonade stands but they wanted to make cookies all by themselves (for the first time) and then raise money to give to The Milo Foundation, a Bay Area dog and cat rescue group. How could I say no to that? Of course we were going there for the third time that week to try to adopt a dog. 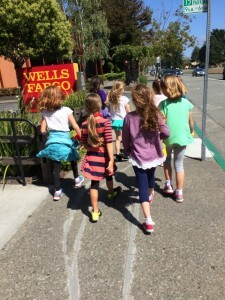 The kids raised $19 and gave it to the foundation. Ironically we didn’t find a dog there, but a few days later at the Marin Humane Society. Guess we know where the next stand money will go. 1. Make excellent homemade product. If it’s lemonade squeeze it yourself. 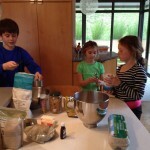 If it’s cookies make them from scratch. Store bought is not an option. 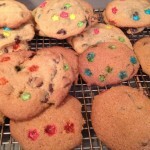 My kids made the recipe from the bag of the chocolate chip bag with some added sprinkles. It doesn’t need to be fancy. 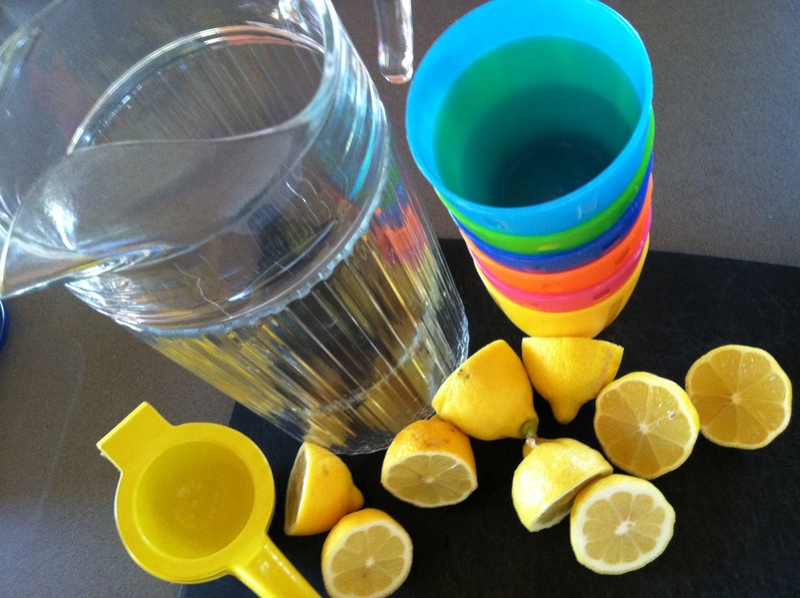 Here’s a lemonade recipe. Heat sugar and ½ cup water over medium heat in a small saucepan. Stir until sugar has dissolved and mixture has thickened, about 2 to 3 minutes. This is simple syrup. Combine lemon juice, simple syrup and additional cup of water to taste. Chill in thermos for easy packing or plastic pitcher, if location is a short walk. Pour over ice in plastic or paper cups. 2. Create fun signs. Kids can get really creative with this one. 3. Set up shop with friends and family to help. 4. Choose a location with lots of people. Think parks, game fields, school. My daughter had a friend over on a sunny afternoon and the first thing they wanted to do was set up a lemonade stand. I was a bit taken back. I’ve never done this before as an adult. It seemed this needed some planning and lemons. Hmmmmm… well I had 5 lemons. So I said we could make a small pitcher. (and I don’t have a plastic one). I got to work on the simple syrup. I realize not everyone does it like this, but this was the part that I knew and was easy for me. Actually my daughter went to her first lemonade stand where the lemonade was from a carton. (I told myself it didn’t matter as long as they had fun) But certainly if I’m the mom of the stand, we’re going to make it. 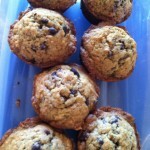 The girls then remembered some chocolate chip muffins I had made the day before and asked if they could sell those too. They sure were entrepreneurial! 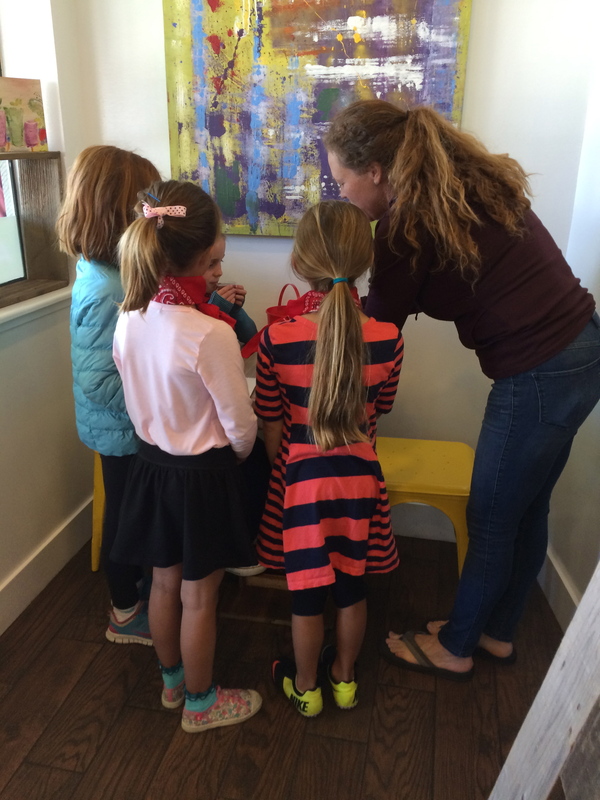 The girls made signs and talked price. I overheard $1 per item and I suggested it be $1 for a combo muffin and lemonade but only fifty cents on their own. They were ok with that. Here’s where I felt a struggle. 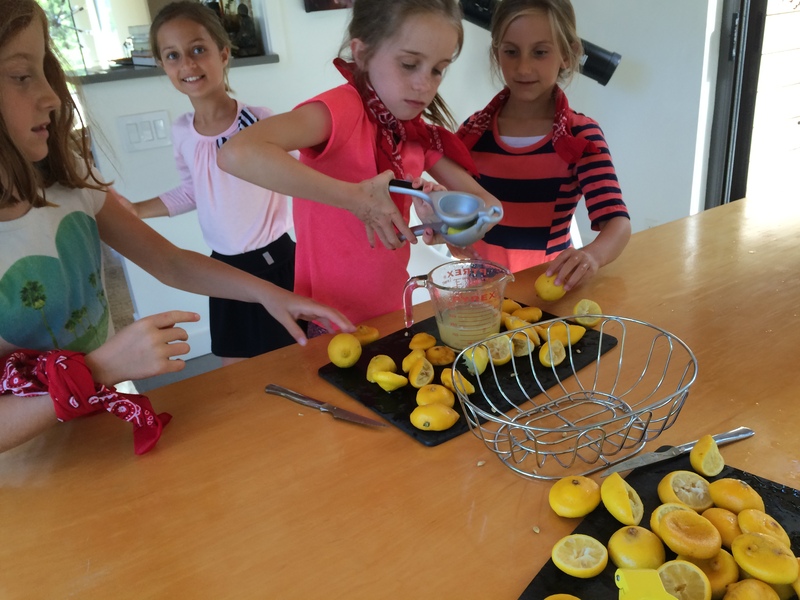 You want the lemonade stand to be cute and genuine, not greedy. It was coming together and my first timer stress was relieved. Did I mention we live at the end of a steep shared driveway? I think this is why the idea for the stand was stressful for me too. We decided we’d have to locate it down the drive and at the park. It was a lovely day and we thought this might actually mean a few customers and traffic. It took my husband and I and the girls to haul all the stand items to the park. There was a plastic tub to set the sale items ( I guess the actual “stand”). The pitcher. Glass at that. 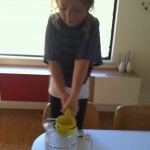 Note to self – buy plastic pitcher for next time. 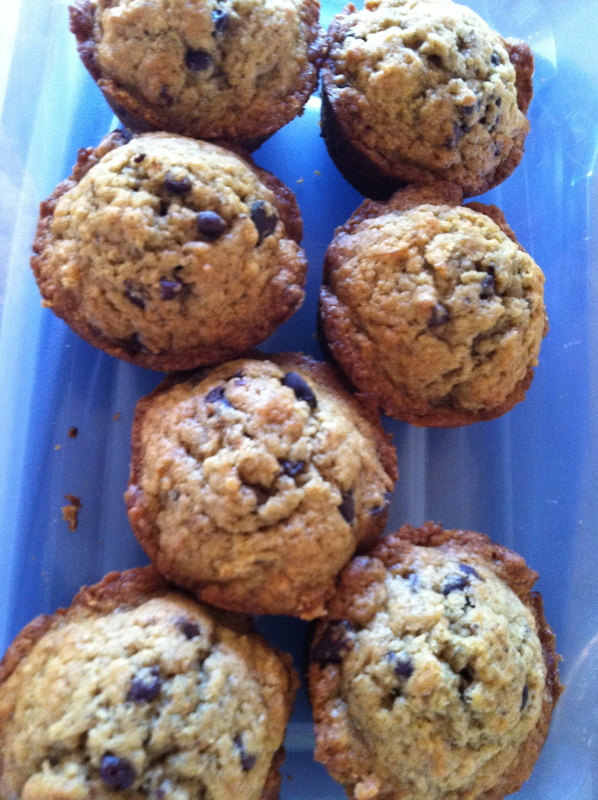 Muffin tray. Tea towel. Plastic cups. Again I didn’t have throw away, so I instructed the girls to please have them returned. 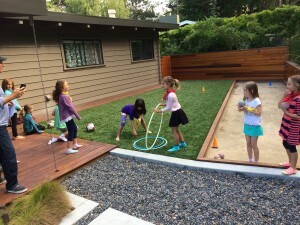 The girls set everything up and after about five minutes left dad in charge and they were going to recruit people to come over from the playground. I went back up to get a change box and when I returned my husband was at the stand and the girls were playing on the swings at the park. I didn’t have high hopes for the endeavor and my husband had things under control so I left for an errand. For us in the San Francisco Bay Area, the temperature has soared this week. 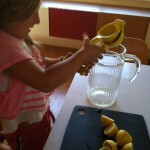 A favorite to quench thirst for all ages is lemonade. In working on my latest book I test drove all kinds of lemonades – sparkling, traditional, herb infused, and more. The basic lemon can really be turned into something special. 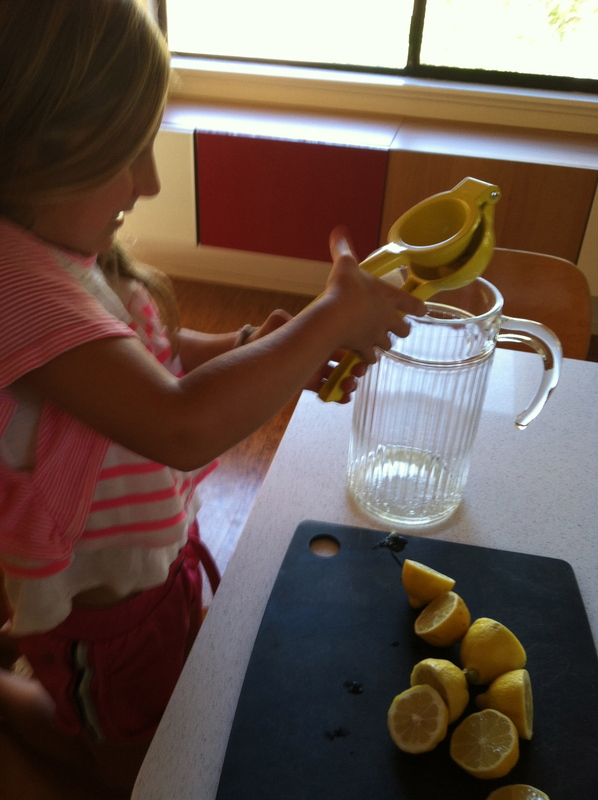 Besides the yummy drink, making lemonade can provide a fun activity for children. If you have a tree, there’s the picking. 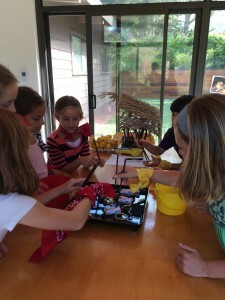 My kids love to go to Grandma and Grandpa’s to pick lemons with “the picker” — a long handled pole. Then there’s the juicing. 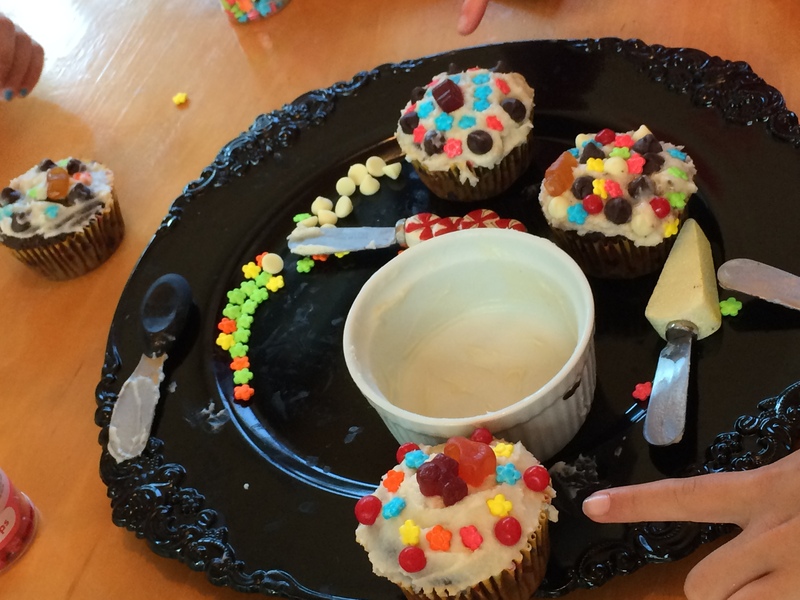 Of course this can be done with a machine, but you can also use a hand-held citrus squeezer. Kids love to test their muscle strength, plus it makes the chore last longer (sometimes a necessity for parents looking for some down time). 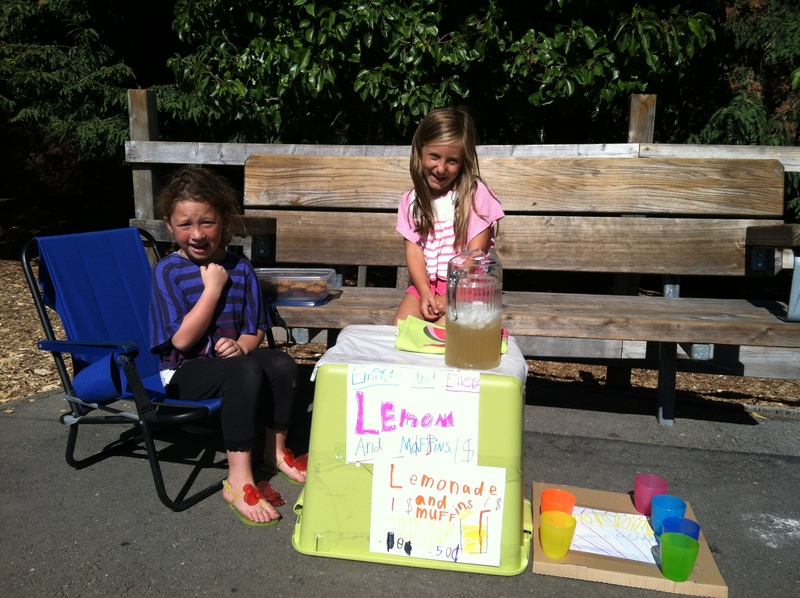 If you have too many lemons and an abundance of lemonade, be sure to share with friends or set up a stand. 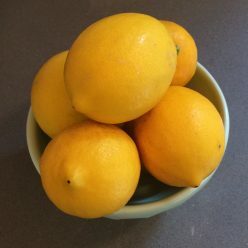 Here are two different recipes, one requiring lots of lemons and ice for a thirsty few and one that makes a glass or two with just a lemon hint (from my friends at SmallShed Flatbreads in Mill Valley, California). This is the perfect lemonade for sipping on a hot afternoon. It is really great whipped in the blender, but if you don’t want to bother you can skip the last step and just pour over ice. Please note the color if this will be golden rather than bright yellow due to the use of raw sugar. You can always substitute white if you prefer. Heat sugar and ½ cup water over medium heat in a small saucepan. Stir until sugar has dissolved and mixture has thickened, about 2 to 3 minutes. This is simple syrup. Combine lemon juice, simple syrup and additional cup of water in blender with ice cubes and blend until slushy. Add more ice as desired. “I have always found foods to be most enjoyable when prepared simple, and nothing is more simple than our house-made lemonade. Frequently our customers will bring a box of Meyer lemons in from their yards and trade us for a Flatbread pizza!” – Ged Robertson, chef owner at Small Shed Pizza. 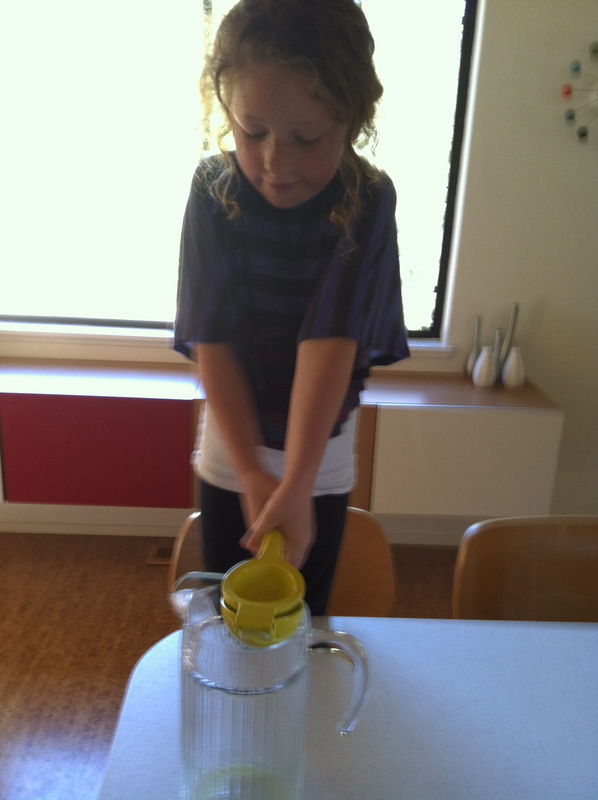 Put ingredients in a pitcher and stir with a spoon. Pour and serve over ice. Tips: first roll lemons pressing between your hand and a counter. This will make them easier to squeeze, and yield more juice. Variations: You can substitute regular still water for sparkling, and honey for maple syrup. This lemonade tastes great made with hot water too!